WilhelmvonHumboldt is a Legacy Library. Legacy libraries are the personal libraries of famous readers, entered by LibraryThing members from the Legacy Libraries group. » Wilhelm von Humboldt's catalog. » Wilhelm von Humboldt's legacy profile. WilhelmvonHumboldt is also an author. About meFriedrich Wilhelm Christian Karl Ferdinand Freiherr von Humboldt (1767–1835) was a Prussian minister and diplomat, a philosopher, and a linguist. 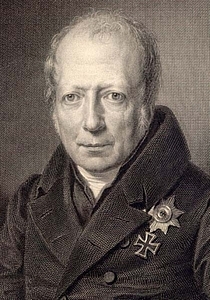 Wilhelm was the older brother of Alexander von Humboldt, famous as a naturalist. About my libraryAfter his death, Humboldt's library was donated to the Berlin State Library, which passed on duplicates to other libraries. Many of those remaining in the State Library were lost in World War 2. A catalogue of Humboldt's original library has been compiled by Christa Schwarz, former head of the historical holdings of the Humboldt University Library.